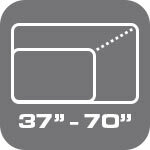 The universal hole pattern allows the wall mount to hold TV’s from 37″ to 70″. Hanging TVs bigger or smaller then the specified size is not recommended. 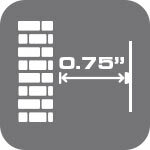 The wall mount has a maximum load weight limit of 75kg or 165lb. 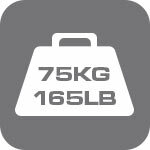 This means that hanging anything heavier than 165lb/75kg is not recommended and not safe. Once you hang your TV on this bracket, the distance between the TV and the wall will be 0.75in. This will allow you to leave enough space for the cables that are plugged in to the TV. This feature is useful in particular when your cables are not coming out of your wall directly behind the TV. Another useful feature of this wall mount is a bubble level. 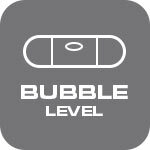 The bubble level will help to hang your TV at the straight angle without having to use fancy, expensive laser precision tools. This bracket is equipped with the spring lock. 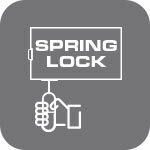 On the contrary to the deadlock, the spring lock features a spring-loader bolt which requires a key only to open the lock.